This post is by Daria Syuzeva of Moscow, Russia. This Saturday, December 24th, Moscow will host another gathering to protest violations during the latest State Duma (Russian parliament) elections. According to the Facebook page, over 38,500 people are already planning to attend, 8,735 people are ‘maybe’ going, and 85,000 people are invited. This means that it’s likely a greater number of people will come to the Sakharov Avenue. During the past week and a half, events have been developing very fast, and so now we can observe the outline of the protests’ organizational core, which I will describe below. The official opposition to the party of President Dmitry Medvedev and Prime Minister Vladimir Putin was doing its best to pull the blanket over themselves and receive their piece of fame: they were active, participated in every public event devoted to the protests, and were pretty aggressive in public conversations. However, they haven’t realized what their role is and who they are dealing with. They made some attempts to organize management committees. However the best description of the public opinion is expressed by KermlinRussia, the very popular Twitter alter ego to President Medvedev: “I have seen our organization’s committee, it doesn’t really represent us.” To tell the truth, the general public agrees with KermlinRussia, and with the help of self-organization the final version of the protest management looks much more civic than it does political. Putin recently had a public conversation with the Russian people that lasted four and a half hours. As economist Konstantin Sonin of the New Economic School noted in his blog, it seems like Mr. Putin doesn’t have an objective and independent picture of modern Russian society. He (Putin) proposed to set web-cameras in every polling station and connect them to the Internet for stations to be transparent, offending the protesters and their initiatives by acting as if he didn’t see any reason for them to be protesting. And this is natural, because according to rumors and Putin’s press-secretary, Mr. Peskov, Putin is to a large extent isolated from society. He neither has a laptop nor access to the Internet, there is only one TV channel that he is watching in his car, which apparently is preparing materials and broadcasting them only for one particular TV viewer (as no one else watches TV in Russia any longer; people prefer Internet). Each day government forces are trying hard to overcome the difficulties they are facing and take actions to decrease the number of protesters and spoil the reputation of the 24th of December gathering. The Kremlin unofficially gives a green light to the candidates, which meets some of the protester’s expectations to calm them. The Kremlin organized another type of gathering on Manezhnaya Square, which was meant to be a supportive rally for the current regime. The official TV channels claimed that the number of protesters that expressed support on Manezhnaya was comparable with the number of people who came out to demand new elections on Bolotnaya. This is false, as you can see from the picture. But more importantly, the attendees of these two gatherings differ in one key respect: on Manezhnaya there were youngsters from poor regions, low-paid immigrants and the retired – all these people received money for their efforts. Conversely, the group that came to Bolotnaya square was very diverse – they were all ages, representatives of Russian middle class, and even the rich. Of course they didn’t receive any money for their attendance. Nevertheless, the protest crowd is in their (our) active phase of self-organization. There are fewer politicians among the organizers, and there appeared an official account on Yandex.Money, a Russian version of paypal. The group would not accept money from any political party. It was loudly declared that the protest is not a political one but a civic one. There are more opportunities and no one can forecast the future: the information spreads so fast, it is getting harder and harder to cheat the public. Russian society is becoming more informed and even sometimes more professional. The government has to compete and this is the last thing they are prepared for. It is really hard to compete with the collective mind of intelligentsia (intelligent people as a class) when your corporate culture doesn’t respect the professional expertise, even if you have a political will. During these four years since the previous elections, Russian society has changed dramatically: it has grown up, learned how to read laws and share information fast. It has a critical attitude towards any kind of media content and knows how to check it. So let us see what we can do — several thousand people against an illegal, deceitful, and forceful regime — after the 24th of December 2011. Thank you for this real-time view from the ground! I’ve heard very good things about the gathering yesterday. Did it meet your expectations? 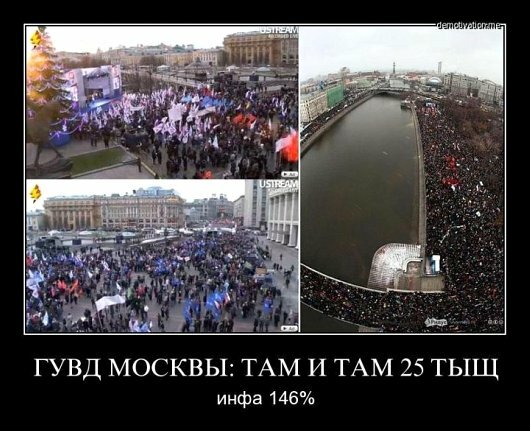 Also, when you compare Bolotnaya Square with the Kremlin-organized event, it seems that people at the former were generally wealthier. Is there also strong support for the protest movement among Russia’s less-affluent citizens?